Durlach, Karlsruhe’s easternmost district, is older than Karlsruhe itself. With its picturesque market square, the defensive wall, the palace forecourt, and the narrow alleys and old stonework, the historic section of Durlach is full of the flair of the Middle Ages. Durlach is is the largest district of Karlsruhe with almost 30,000 residents and is often referred to as the “mother” of the city as Durlach was the residence of the margraves of Baden-Durlach. In 1715, however, Karl Wilhelm moved his court to Karlsruhe. Durlach remained an independent town. It wasn’t incorporated into Karlsruhe until 1938. You can easily lose your way in the maze of mediaeval alleyways in the traffic-calmed heart of the old town. Easily discernible in the picturesque townscape is the old protective wall, parts of which still survive today (e.g. the Basle Tower gateway). Well worth a visit are the town church, the “Karlsburg” (the old residence) which was originally a Renaissance building, the market square, and the town hall. On the town hall balcony stands a figure of a knight, holding a sheet-iron flag in one hand and a shield bearing the Baden coat of arms in the other. It is said to be a statue of Margrave Karl II, who made Durlach the royal residence in 1556. In common parlance of the past, Karl II’s nickname was “Karle mit der Tasch” (Karl bag-in-hand) because the margrave apparently always paid craftsmen their wages in person from a bag he carried. 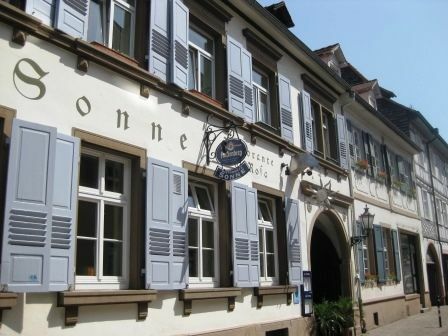 Today, Durlach’s former palace residence accommodates establishments such as the Pfinzgau museum, a branch of the Karlsruhe municipal library, and the music school “Badische Konservatorium”. The Durlach residence’s gardens are the City of Karlsruhe’s oldest. The people of Durlach love to celebrate. Their carnival parades, the Old Town festival, the “Kultursommer” theatre festival, and the mediaeval Christmas market are all events that attract visitors to Durlach in their thousands.